Show-stopping, high gloss formula produces a radiant shine. 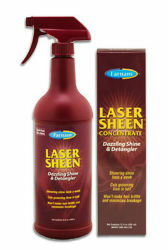 Laser Sheen® detangles manes and tails, leaving them shinier and more manageable. It won't dry out or damage hair, minimizes breakage, repels dust, dirt and stains to cut grooming time in half. One application bestows a showring shine that lasts a week.